The design and manufacture of almost every Epicurean product starts with Richlite, our exclusive wood fiber composite proudly made in the United States. This material is a perfect fit for the home and professional kitchen. 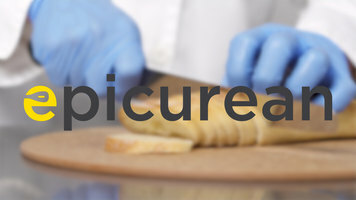 Epicurean products are practically maintenance free. This non-porous material resists stains and is dishwasher safe. When you're done using your board and tools, simply toss them in the dishwasher and your work is done! Your knives will stay sharp longer when used on Epicurean boards; although our boards are harder than wood boards, your knives score easily while you chop and slice. This scoring means you'll spend less time sharpening your knives, less time prepping, and more time enjoying your food. Epicurean products made with Richlite are heat-resistant up to 350 degrees Fahrenheit. You can keep your counters safe from hot pots and pans by using your boards as trivets, and Epicurean tools will stand up to the high heat of boiling and sauteing. Epicurean products are tough and built to last. Before Epicurean existed, its founders were building custom skate parks across the United States. They used Richlite for the desks and ramp, where they held up under the toughest conditions. You can be sure you Epicurean products will stand up to whatever you throw at them. A wide of thicknesses and colors are made possible by Richlite's manufacturing process. Richlite is made by layered sheets of paper bonded with a food-safe resins. The paper can be tinted and layered to make unique and attractive profiles. Finally, Epicurean boards and tools will not harbor bacteria. Our material has been tested and approved by NSF, the organization that tests products to verify that they meet public health and safety standards. You won't have to keep separate boards for meat and produce! Simply give your Epicurean board a wash after prepping meat, fish, or chicken, and move onto your produce. Epicurean products made with Richlite make all of your work in the kitchen easier, faster, and safer. Epicurean's exclusive wood fiber composite, Richlite, is sure to transform the way you think about cutting boards. 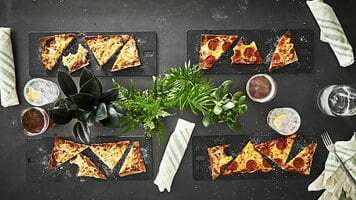 Dishwasher safe, non-porous, and heat-resistant up to 350 degrees Fahrenheit, Epicurean boards offer a sanitary, long-lasting addition to any kitchen. Get to know Epicurean cutting boards and what differentiates them from other brands, including their sustainability and long lasting surfaces! Learn how to quickly and easily set-up and change blade on this De Buyer "Swing" mandoline. Watch as the mandoline effortlessly and safely slices different-sized potatoes and vegetables. It's just that easy!